In a temperate climate, the heat from the sun can make your home feel like a greenhouse. Reducing the amount of sunlight coming through your windows is a good way to make your home more comfortable and save on cooling costs during the warmer months. 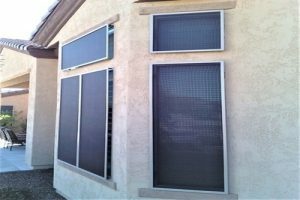 Window sun screens, otherwise known as solar window screens, are a great solution for homeowners looking to keep the sun out of their home. As experts in the window industry, we have installed window sun screens for many satisfied homeowners and witnessed the benefits of these screens firsthand. A window sun screen is a mesh made from fiberglass, metal wire, or other synthetic fiber, installed within a frame and is designed to cover a window. These screens can be permanent, or removable if you would like to let in more light during the cooler months. Window sun screens are effective against the temperature transfer that occurs on the surface of the glass and are most effective when mounted on east or west facing windows. Window sun screens prevent internal heat from being lost through windows to the outside, stopping as much as 50% of radiant heat transfer. Because less heat is allowed indoors during the day, the temperature indoors remains comfortable all through the night. This reduces the amount of air conditioning needed during the summer. During the winter season, heating costs are also reduced because more heat is conserved and unable to escape your home. Compared to installing new energy-efficient windows, sun screens have a low initial financial cost and can be a solution for homeowners looking to lower their energy use on a budget. Another benefit of window sun screens is privacy because the screens reduce visibility from the outside, preventing any passersby from seeing inside your home during the day. This provides increased home security as it keeps your belongings out of view. Instead of relying on curtains or blinds for privacy, you can rely on sun screens without sacrificing your view from indoors. As a bonus, you’ll avoid having your curtains or blinds fade due to constant exposure to sunlight. Window sun screens help limit the amount of heat in addition to direct sunlight entering your home. Direct sunlight can often hit surfaces in your home and reflect back, causing eye strain and discomfort. It can be hard to keep your home as dark as you want during the day, because curtains and blinds can sometimes be insufficient for blocking all sunlight. Additionally, glare from direct sunlight can make it difficult to watch television or to use a computer during certain times of the day. With window sun screens, you will no longer have to deal with unavoidable glare and the effects of direct sunlight in your home. In addition to limiting heat and direct sunlight, window sun screens can also make your home more comfortable by providing shade and relief from the outdoor temperature. Sun screens can help lower the temperature indoors even on the hottest summer days, reducing the strain on your air conditioner and helping you and your family stay cool and content. Window sun screens enhance the look of any living space with their attractive and appealing design options. Sun screens are also available in various sizes and shapes to suit your home. At True View, we offer several different colors for both the frame and the mesh of your window sun screens. No matter what style you are looking for, we can help you find a sun screen that is right for your windows. Window sun screens can be very useful for preventing ultraviolet (UV) radiation from entering your home. For example, furniture, rugs, and curtains can often fade when exposed to too much UV radiation. With window sun screens, this problem is reduced, and the fixtures in your home will remain in good condition and free from UV-related damage. While there are many advantages to window sun screens, they may not be right for every homeowner. Fortunately, there are other options that can give you the same energy-efficient savings and protection from UV radiation. Awnings: These roof-like shelters can be installed on the exterior of the home to shade windows from heat and glare. Exterior shutters: Shutters are effective at reducing solar heat gain by physically blocking the windows from the exterior. Replacement windows: Having modern and energy-efficient windows installed by a qualified professional can help you save on your energy bills. When you work with True View for your window needs, you can rest easy knowing that you are working with experts. Whether you are in the market for new energy-efficient windows, looking to fix a broken sash or lock on your current windows, or are interested in window sun screens, we are here to help. Contact us today to get started with a free over-the-phone quote.